Working with and Insecure dog. We’ve talked about shy, fearful and insecure dogs before in our The 6 Main Personality Types of Dogs series. It talked mostly about which personality types of dogs work best together, and how the different personality types of dogs interact. But now that you’ve decided which personality type your dogs are, how do you work with each personality type. If you haven’t figured out your dog’s personality type, but you think he/she may be and insecure dog, look for these signs. Keeping his/her head low, ears down, tail tucked. They may cower when you reach for them, or submissive peeing. Some insecure dogs chew or bark constantly. If your dog does any of these things consistently, then you most likely have an insecure dog. An insecure dog tends to be very submissive and lack the self confidence that the other dog personality types have. This can be due to many different factors. Lack of socialization as a puppy, trauma, and even just change in circumstances. If a dog had a stable home for a while, then ends up in a shelter or rescue, it can cause the dogs to become insecure, or fearful. Not to mention dogs that come from neglect, or abuse. And if you have a rescue dog, you may never know exactly what caused this trait in your dog. But the reason your dog is insecure, is not a big factor. Helping them work through their insecurities is what’s needed. Some insecure dogs, after training and stability can actually turn themselves around and become very social dogs. Other won’t, but they will get better. An insecure dog needs an owner that is patient, calm and consistent. Yelling at an insecure dog will only make things worse. Stay calm, and consider your dog’s needs and feelings. Be consistent during basic training. An insecure dog needs this, it will help build their self confidence, and their confidence in you as their leader. Ignore the insecure behavior, and praise him/her when he/she displays self assurance and confidence. Especially when he/she tackles something that used to terrify them. But avoid coddling, or it can be seen as a reward for the insecure behavior. Use only reward based training, never punishment or force. Forceful training will only make the dog more fearful and insecure. Crate training your insecure dog is a must if they display separation anxiety, or destructive behavior when unsupervised. It gives them a secure, safe place of their own to retreat when things get to be too much for them. 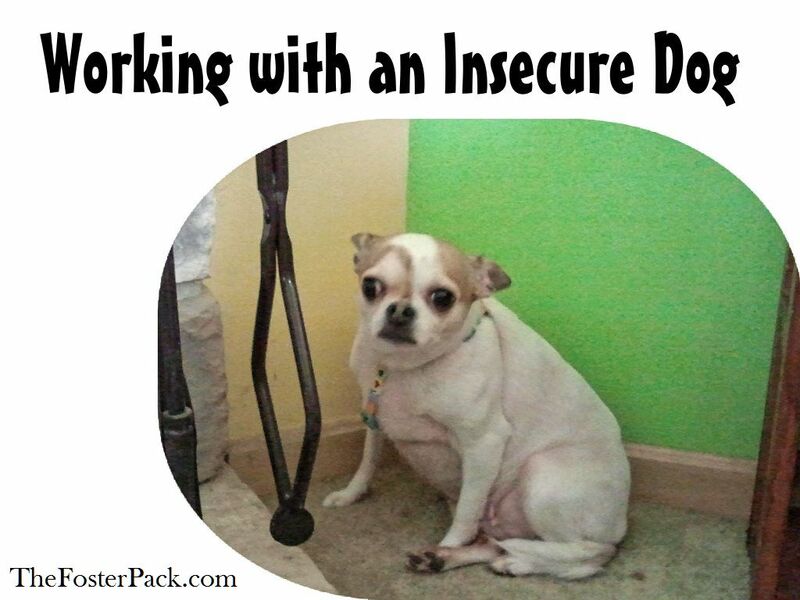 As your insecure dog starts to come out of his/her shell, start socializing him/her more. Introduce them to new people, places and activities slowly. Stay calm while doing so. Your dog will pick up on your nervousness and will act accordingly. Just have patience. Most dogs will eventually come around with enough work. I’ve seen many of our foster dogs turn around, some in a few weeks time, others have taken a bit longer. But most of the insecure dogs we’ve had come through our house have gone on to become wonderful dogs, who fear little.